People are confused. Messages are flooding my inbox and my social media accounts from students, friends and colleagues regarding the debate about Google Hall of Fame. Questions and more questions. Based on my analysis, I tried to explain that “it’s not a bug, it’s a current mechanism – although I’m not the Owner of Google VRP”. It seems like three groups with three different mindsets are combating with each other. Please Note: I’m not pointing fingers at anyone; I’m trying to explain groups with the same mindsets. Group A = We worked really hard to get into the Google Hall of Fame. But, nowadays beginners (I won’t use the word ‘Kid’ here, because we should respect each other) are getting into the Hall of Fame. Back of their Mind: Why and how it is possible? They’re getting into the HoF with limited knowledge; there must be a problem with Google. Group B = We’re more curious and are looking for ideas. How can we get into the Google Hall of Fame? Group C = We got into the Google Hall of Fame and, no matter how it happened, we don’t care. Well guys, that’s the whole reason behind this post. Please Note: I’m not defending Google’s Hall of Fame mechanism. Right or wrong that’s the different story. I am trying to explain the mechanism behind the Google Hall of Fame with proof and references. Analysis: Based on above scenario, you will not get the second email from Google Security Team in which they“Triaged” your report ……. Just because you have submitted an Invalid Report. Still confused about your profile entry at Google’s Hall of Fame? I’ve created another proof of concept for your better understanding. Finally I got Google Hall of Fame without reporting anything….. Analysis: Based on above scenario, you will not get any confirmation email from Google Security Team because you haven’t reported any bug yet. It’s Google VRP’s current mechanism, meaning Google added your profile at the honorable mention’s page under the heading of Hall of Fame automatically at the time of creation, as I have proved with my second POC. Google VRP’s is based on a ranking system. Please understand “it’s a current mechanism of Google VRP”. Please Note: The current Mechanism is right or wrong, better or worse, logical or illogical – that’s a separate discussion and seems to be out of scope for this post. Confirmation Email as mentioned in First POC. So please don’t victimize yourself. Post a valid bug and get the reward! This is fake bounty. 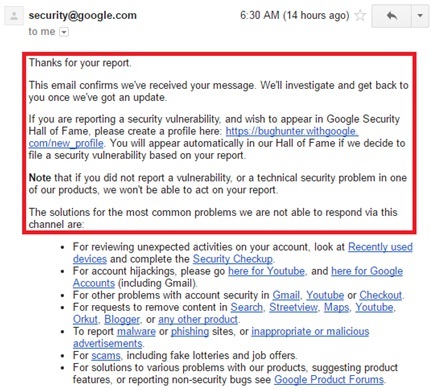 Google isn’t paying bounty for this bug and Rahul Singh (https://www.facebook.com/rahulcracker) is the only one who reported this bug and got Hall of Fame. Take down this article or the part mentioning screenshot of fake bounty. 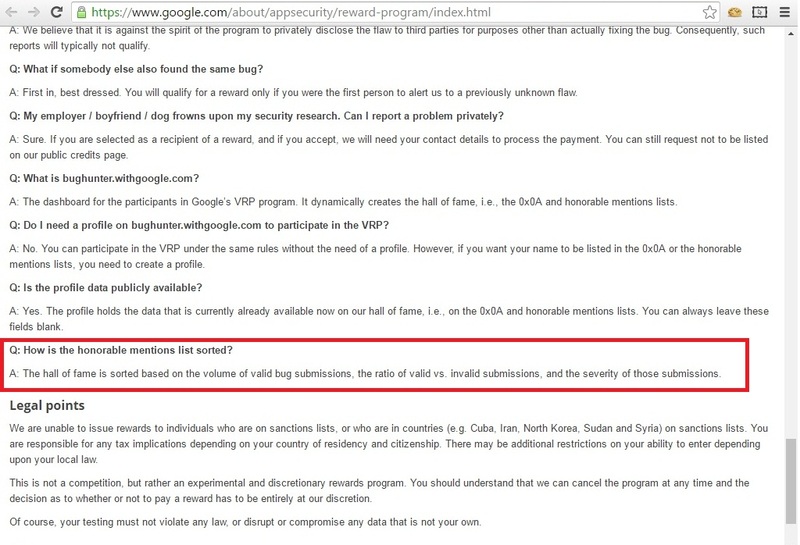 Sorry, my bad I thought this bounty PoC is for the google fake hall of fame (which you mentioned as an example) bug as Rahul Singh reported this as a bug and rewarded HoF but not bounty. You can delete this comment if you want. Nice website anyway. Keep up the good work ? Bounty screenshot related to Valid Bug report Kid. Reason for posting this screenshot here in this write up is to clear the concept of readers regarding the Google Hall of Fame Bug / Mechanism. Request To Admin: Please Increase the maturity level of this website, that will help the authors / contributors to entertain the genuine request rather than this kind Script Kiddies.